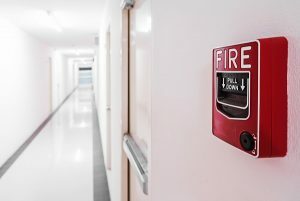 Every school needs as much fire protection as possible. Every school needs as much fire protection as possible. Much like hospitals, hotels, businesses, and stadiums, they are full of people every day, all day. Making sure that there is enough fire protection equipment is only part of the problem, the other part is ensuring that fire safety is emphasized as well. Fire sprinklers can help put fires out before they spread, no matter what part of the building they are in. However, some areas would benefit from fire suppression systems instead of water-based sprinklers. It is important to have the fire sprinklers tested and inspected on a regular basis, because if they don’t work, it can be a problem. Functional fire sprinklers can also prevent massive property damage. Suppression systems are useful for the parts of the school where the risk of water damage is too high and can ruin high-value equipment. Kitchens and science labs are two rooms that benefit from fire suppression systems. Outfitting the kitchen with commercial-grade hoods is one way to make sure that cooking fires can be quickly and easily contained. The chemicals in labs can also cause unpredictable reactions, some of which can be a fire that can’t be stopped by a fire extinguisher. Fire alarms serve as an indirect form of fire protection. These alarms don’t prevent a fire from starting, but can prevent further disaster. The alarms notify everyone in the building that there is a fire and that it is time to evacuate. The alarms are also a key component of running an effective fire drill. Fire extinguishers are also necessary. Even small fires can become more dangerous if they aren’t stopped from spreading. All staff and faculty should be trained on how to properly use the fire extinguishers located all over campus. Even if the school has portable classrooms behind the main building, they need to have fire extinguishers as well. Everyone in the school should be taught about the importance of fire safety. Again, the teachers should be trained on how to use the fire extinguishers, and also what to do when a fire starts – they have to lead the evacuations and make sure that the students get out safely. It’s also important to remind everyone of where the evacuation points are and where to meet once everyone has gotten outside safely. This entry was posted on Wednesday, April 10th, 2019 at 10:37 am. Both comments and pings are currently closed.